The leaves are technically described as lanceolate / oval, i.e. they are spear shaped and have 'teeth' along their edge. The leaves are arranged in pairs and set opposite to one another. Each pair is arranged at 90 degrees to the previous pair. 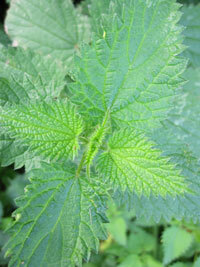 The nettle leaf is probably best known because its ability to sting. 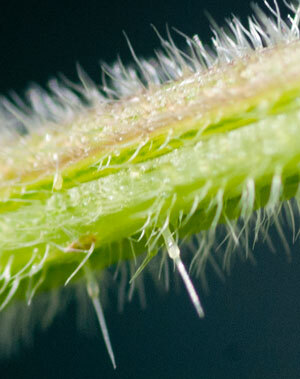 On the surface of the nettle leaf are many hair-like structures - see below. 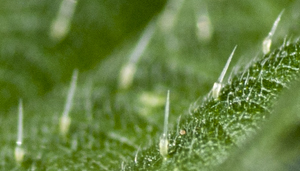 These hairs are, in fact, hollow tubes (to see them in detail visit http://www.arkive.org/common-nettle/urtica-dioica/video-10a.html?offset=0px). Each tube (or trichome) and its swollen base is filled with a cocktail of chemicals, which includes histamine, serotonin, formic acid and acetylcholine. The tip of the tube is easily broken, leaving a sharp point that can penetrate the skin delivering the concoction of chemicals, which result in the characteristic rash of a nettle sting. These fluid filled tubes or trichomes are present on both the leaves and stems of the nettle - see picture below under Ecology etc. The plants are dioecious, that is, only male or female flowers are found on any one plant. The flowers are small and form at the base of the leaves, greenish / white with yellow anthers. According to Mabberley’s Plant Book, the anthers are bent down whilst in the flower buds but when ripe, they spring upwards and release a cloud of smooth pollen to be carried away on the wind. That is, nettles are wind pollinated or anemophilous. Nettle plants can produce large quantities of seeds, it has been estimated that a plant growing in the shade can produce between 500 to 5000 seeds, whereas one in the full sun may produce up to 20,000 seeds. 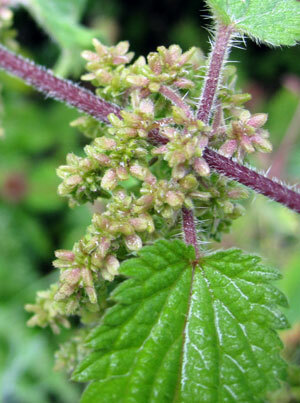 Stinging or common nettles (Urtica dioica) are widespread across the U.K. They can be found in woodlands, hedgerows, gardens and disturbed ground. They tolerate a wide variety of soil conditions, though they seem to like moisture and soils rich in nitrate and phosphate. Given these conditions, nettles can grow to a height of a metre or more. In addition to their prolific capacity for seed production, stinging nettles can reproduce / spread vegetatively by means of their underground stems - rhizomes. 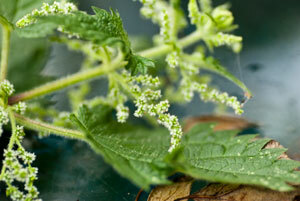 Nettles are much favoured by the caterpillars of various butterflies – such as the peacock and small tortoiseshell. The stinging nettle has had many possible uses ascribed to it, from nettle tea (see the woodland blog) to cloth making; indeed there is some renewed interest in the nettle for fibre. In fact, 101 uses for stinging nettles are detailed in Piers Warren’s book with that name; alternatively visit the wild-eye website to see the list of suggested uses. Perhaps one of the stranger things about nettles is that there is now a World Nettle Eating Championship; for those tempted click here for further details.